Wouldn't "Advanced English Language & Usage" be more appropriate and cut down the ELL questions? Just by the name of the site the users who post "ELL" are right. I believe this site poorly named. I shouldn't have to read a 3 minute preamble to figure out if my question belongs here. I would assume as a user that I have a question regarding English, so I ask it here. Now maybe this was named before ELL was a little sperm swimming to the SE egg but things need to evolve. We shouldn't be closing 50 questions a day (I am just making that number up). Edit: In no way do I want this question to construe any need for changing the policy of this site one way or the other. I simply chose "Advanced" because it is the first thing I thought of. The question was more about the confusion - to even "advanced" English speakers - on where they should go to ask a question. I find that these two sitting next to each other in the dropdown adds on to the confusion even more. So question I raised is proposing changing based on confusion, not new site boundaries. Although I have no data to back this up, it's at least possible if not probable that people are simply using english as the URL because "There must be a Stack for English, right?" I would suggest swapping the URLs around, so english.SE goes to ELL and ELU gets ELU.SE. Or, if that's too much of a change, have english.SE go to a disambiguation page which directs questioners to either ELU or ELL. That would presuppose that there were fairly explicit guidelines which could be concocted to direct questions correctly. There will always be borderline cases, but there are a large number of questions here which are obviously asked by people learning English as a second language who simply want basic help about which preposition to use in a particular sentence, rather than the reason or history of using that preposition. In my answer below, I originally misinterpreted RyeɃreḁd's intent with his question. The issue at hand is how to distinguish between ELL and ELU, and how to guide people to the right one, not how to craft ELU into an academics only site. Don't put undue emphasis on his choice of the word advanced. I have less insight to provide on the best way to do that. I disagree that this site should be about advanced English. If you squeeze all the learners into ELL, and this site becomes only about the most hoity-toity academic pursuits, where does that leave the vast majority of everyday speakers who would like a little assistance? They'll still pick one or the other, and if they're using the language everyday, they'll avoid the "learners" site and come here anyway. No, I think things are right the way they are now. As martin f said, the distinction is between learning the language, and how to use the language you already know. Other SE sites can suggest to a questioner where to send their query, or warn when a question might be chosen to be closed based on the structure in the title. Why not a technical measure of some kind? I know there do exist some text analyzers that can do a grade-level rating of a body of text. If it measured the post as being below a certain score it could kick in at time of post to offer the suggestion. "Your post was analyzed by machine as containing a large number of spelling and grammar errors. Is your question actually about basic learning of English? 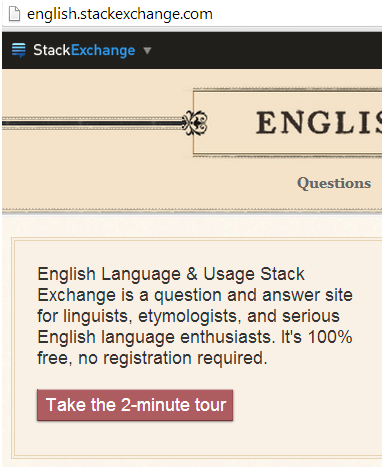 If so, the right place to ask it might be on a different site... click here to have your message posted on ELL"
Both sites are about "English." But "ELL" is about "elementary" English (which is reasonably well defined by "learners" and ELU is about "advanced" English. So a good name for this site would be "Advanced English," with or without "Usage." I recently got into hot water by posting a "basic" question here. The median user was far more "advanced" than the question, which was heavily criticized. If I had it to do again, I would post it on ELL. Any division between English Language Learners and English Language & Usage has to be arbitrary. Why not just scrap it and merge the two? I personally find the whole business of vetting a question irritating - who am I to judge? Who is anyone? Combining levels works perfectly on a forum I used to inhabit (Wordreference - It has its faults too). But, you object, I don't want to answer trivial question about whether to say "Where are you?" or "Where you are"? Well the answer is straightforward - Don't. All we have to do is self-select. Pick the questions that interest us and ignore the others, no big deal. Apart from any selfish considerations, think of newcomers. What sort of welcome is it to be greeted with votes to close your question? Amalgamate them. That's what I say. Why isn't the yellow axe question (YAQ) about English?